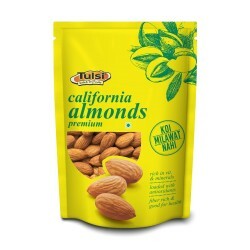 California Almonds There are 7 products. Bestseller product from the house of Tulsi, sourced from California USA. Best as a serving for cocktails and evening tea. Prevent heart diseases and heart attack. Helps to control blood sugar level. Good source of manganese and copper. Naturally gluten-free. Storage information- Keep it cool and dry place.